Last month, I committed to finish an old book that I’d fiddled with for years. I ended up finding a local historical thread for my story, getting the synopsis updated, and adding eighteen pages to the book. I’ll take it. Not as much as I wanted to do, but it was a busy month with out of town visitors and a revival at our church. 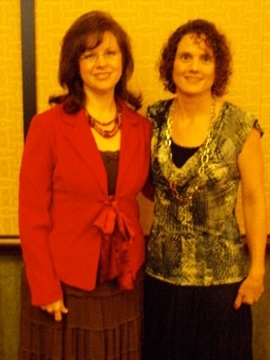 Back in 2010, I met Jennifer Slattery at ACFW in Indianapolis. She’d been on my blog, but we hadn’t met in person. She was a first time conferee and I was a repeat offender since 2005 with my first contracted 3 book series that released that year. I recognized her and invited her to sit with me for a meal. We hit it off, became frequent e-mail writers buds, and hosted each other on our blogs back and forth over the years. After she got published, I sent her a congratulatory e-mail. A few years later, she asked how I was on critique partners. I’d had two since 2008, but since all three of us were published by this time, we didn’t always have time to critique each others work with dueling deadlines. Jennifer and I became critique partners and there have been times she saved me by having time to critique before my tight deadlines. I hope I’ve rescued her a few times too. 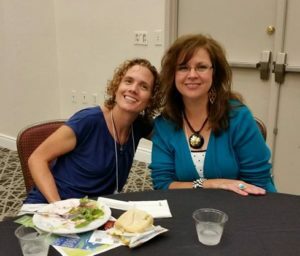 Three years ago, she asked me if I’d be interested in teaching at a writers conference near Atlanta, Georgia. She was the keynoter and wanted to recommend me. I lived 5 years of my childhood in that area and still have family members there. I said yes and got to teach, get together in person with Jennifer for the 2nd time during our friendship, and see my family and friends in my old hometown. When Jennifer and I get together, it never seems like we have enough time. So when she mentioned she and her husband might come through my area earlier in the year, I was so excited. They came to our house last month. We got to spend about 6 hours visiting together, I got to meet her sweet husband, and we had lunch with them. 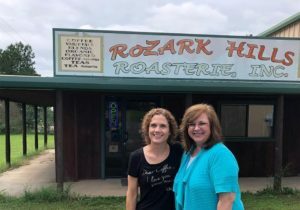 Jennifer and I share a love for coffee, so I took them to Rozark Hills Coffee. It just so happens that the man who set up the first Starbucks factory in New York retired in tiny Rose Bud, Arkansas. They roast gourmet coffee there these days. I didn’t know about it until I set my first series of books in the area and someone mentioned it, so I incorporated the roasterie into my book. Since then my husband and I have been frequent patrons. Jennifer and her husband loved it. Since it was Wednesday night, they went to church with us. It was business meeting and potluck night, so we had a eating meeting, and they headed to their hotel to hit the road early the next morning. We thoroughly enjoyed our visit, but we didn’t have enough time. My cousin Jackie is four years older than me. When we were younger, she lived in Memphis and I lived in Georgia. When we made summer visits to Arkansas to see my grandparents, we always stopped in Memphis for a visit. Sometimes Jackie and some or all of her three siblings would come with us to Arkansas. And once I moved here when I was twelve, I went to Memphis for a few summers with them. Until I was fourteen and they moved to Ohio. We saw each other sparingly for several years. Until Jackie moved to St. Louis. We’ve both been back and forth for several visits since then. She and her mom are readers, so they’re two of my biggest cheerleaders. 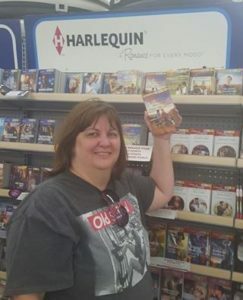 This pic is a few years ago when my first Love Inspired title hit Walmart. Our visits have never been long enough. She and her husband came for a visit just a few days after Jennifer left. They came here because they’re planning to move. Here. I mean here, on the same road we live on, withing walking distance. They came here to check into rental housing until they can build. I have lots of family here in Arkansas, so I’m used to having lots of cousins near. And I take them for granted. Since they live here and I can see them whenever I want, some I only see at holiday gatherings. But now our strays who’ve wandered away from the roost are coming back. Jackie’s parents are planning to move here also. I can’t imagine what it will be like to be able to see them whenever I want, but I’m looking forward to it. I think it will make our whole family closer and maybe we won’t take each other for granted. Of course while they were here, we had to have a family gathering that included pizza. That’s our cousin Melanie in the middle. I’m looking forward to lots more cousin fun once Jackie gets here in November. But I’m still going to finish my French guy book, so I’ll give an update with each of my posts. What about you, had any visitors lately? Family or friends moving close to your area? Family or friends you wish you could see more often? I’d love to hear about it. 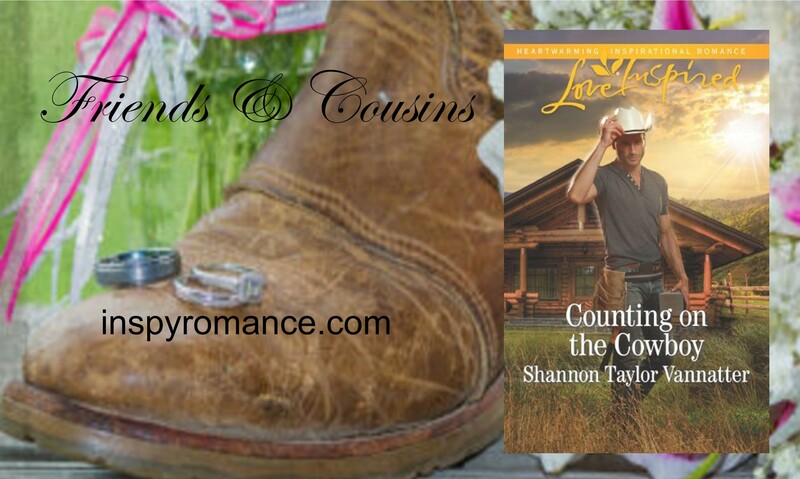 Award winning author, Shannon Taylor Vannatter writes contemporary Christian cowboy romance and has over a dozen published titles. A romance reader since her teens, she hopes to entertain Christian women and plant seeds in the non-believer’s heart as she demonstrates that love doesn’t conquer all—Jesus does. She gleans fodder for her fiction in rural Arkansas where she spent her teenage summers working the concession stand with her rodeo announcing dad and married a Texan who morphed into a pastor. In her spare time, she loves hanging out with her husband and son, flea marketing, and doing craft projects. 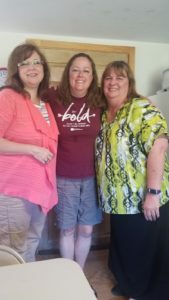 Since I wrote this post, I learned my cousin and her husband are coming back this weekend to look at a rental house. I’m pretty excited, Wemble. Hi Shannon! As a retiree, while living in Chicago I remember the revolving door at the Pennington Inn, where we sometimes barely had time to change the sheets on the bed between visitors. Unfortunately since my cousins live in Germany, we have not seen each other since 2009. In September my husband celebrated his Tennessee and Florida cousins mom’s 95th birthday at the Michigan hospital, where Aunt Rosemary was the first baby born there. Since he is working on his family genealogy, he enjoyed the interaction with his aunts, uncle, and cousins from Florida, Tennessee, and Michigan. Best wishes. Hi Renate, I’m an only child, so I think cousins have always been important to me. They were the closest thing I had to siblings. I wish Jennifer was moving here too. Hi Paula Marie, Facebook is great for keeping in contact, but it’s definitely not that same. At least cell phones cut out long distance phone bills and there’s always skype. Which I’ve never done, but it looks like a great way to feel like you’re actually with the person you’re talking to. We moved to be closer to our kids and grand kids. We get to watch our 2 year old granddaughter while her mom teaches. We’re blessed being able to see everyone frequently! Hi Diana, the thought of our son moving far away gives me nightmares. Long distance grandkids (far in the future since he’s only 16) are not what I have in mind. I guess we’ll be like you, follow him. I’m glad you’re getting to be a hands on grandmother. I haven’t had visitors, but I just got home from being one! A cousin’s daughter got married last month, and had a reception last weekend, so my aunt, the cousin, another of her daughters and I flew up to Seattle. I got to stay with another cousin and his wife, and saw lots of cousins during our week-long stay. It was great! That sounds like a great visit, Margaret. Wedding are great for bringing families together. I’m really excited that my cousin and her husband will be at our Thanksgiving and Christmas gatherings in the years to come. I am very familiar with Jennifer’s writing, but have never met her. You have a top-notch critique partner and friend! Yes, I do Julie. By the time we became critique partners, I’d had around 10 books published while she had two or three. But I’ve learned so much from her. She’s great with things I stink at. HI SHANNON IT IS ALWAYS NICE FOR OUR FAMILY AND FRIENDS TO LIVE CLOSE TO US SOME OF MY FAMILY I HAVEN’T SEEN IN YEARS BECAUSE THEY LIVE AWAY FROM MY AREA. I DON’T SKYPE EITHER FB IS NICE TO STAY IN CONTACT BUT SOMETIMES I WOULD RATHER TO TALK TO MY KIDS IN PERSON OR ON THE PHONE. HAVE A NICE DAY! Like I said earlier, Sarah, one of my biggest fears is our son moving across the country someday. I just don’t know how parents cope with that. My cousins from Ohio came to New York for our sons wedding. I think they were a little overwhelmed by the traffic, busy people and how late everything was open. I bet, Maryann. That would be a culture shock. I used to live in a suburb of Atlanta, Georgia when I was a kid and I still have family there. When we visit, it’s overwhelming for us. It’s changed so much with population and traffic. When they come here, they’re probably bored. One time, they came when the nights were nice and cool. I had the windows open. The next morning, my cousin had her window shut and I asked if she got cold. She said it was too quiet and she couldn’t sleep. My brother got married 3 years ago and moved out of state. However, he and his wife moved back temporarily this summer and are planning to move to the area in January. I am really looking forward to having them close again. I bet, Jessica. It’s sad when family and even friends end up scattered. Hi Natalya, I’m so glad you and your friend still visit. That sounds so fun. French guy book? Tell me more! We have been visiting family but haven’t had any come this way. We had a friend stay with us for a weekend in September. He was in our area for work so hosting him gave him a break from staying in a hotel for three weeks. Hi Arletta, I started my French guy book several years ago, but kept getting deadlines for other books and never got to finish it. I’ve resolved to finish it, but it’s been a busy time. I blogged about it last month here: https://www.inspyromance.com/inspiration-making-it-happen/. I still plan to finish the book though.